WeChat is one of the most widely used apps in China. With over 900 million users, the app has been making waves in China with their constant innovations and updates! It’s only natural that the most popular app has somehow affected the purchase behavior of users online. Mobile has become the most popular device for online shopping in China. Around 84% of consumers have made their purchases from a mobile device in 2017 whereas it was 71% in 2015.Since the majority of the sales are made on mobile, brands must be able to advertise and engage with users on the platforms they frequent the most. In an era where social media is everything, it plays a huge role in affecting the purchase behavior of users. Brands are starting to understand the true potential of social media and they are focusing their energies towards reaching out to potential customers on digital. 51% of consumers open push notifications sent from a brand’s official WeChat account. 27% consumers indicate that they tend to buy more after receiving those notifications. The demand for E-commerce in China has been increasing rapidly and acts as a key catalyst for retail. Infact, the growth in E-commerce has been surpassing the growth in offline retail. Last year, online sales grew by 28% whereas, offline sales only increased by 5%. E-commerce is not only seeing an increase within China, but also in international purchases. The percentage of customers that buy from overseas website have risen from 34% in 2015 to 64% in 2017. Young shoppers from 18-35 years are the leading force behind this surge. 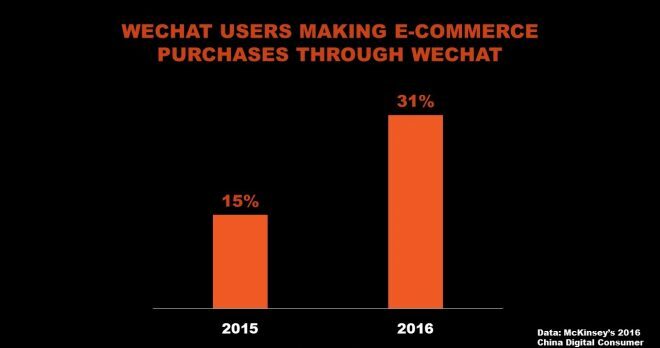 With this huge untapped potential for rise in E-commerce, it would be interesting to see how brands are leveraging WeChat to achieve their goals.